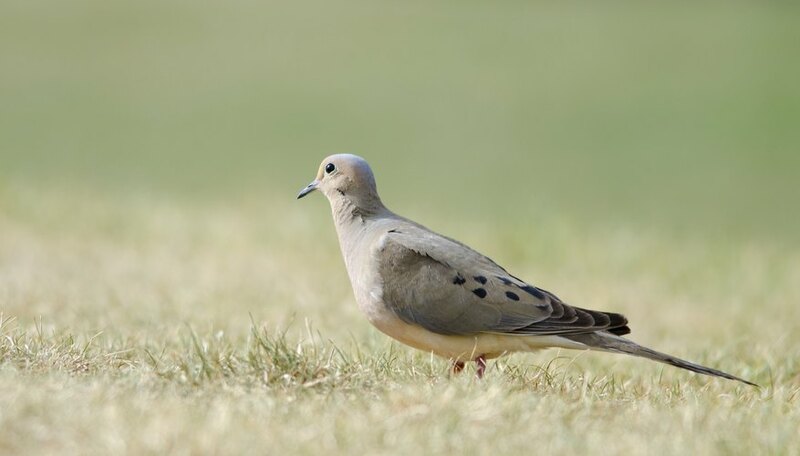 The gentle rise and fall of the mourning dove's (Zenaida macroura) call echoes its soft, gray-brown body. Look closer and you’ll see that males of this species have a neck that is ringed with pale purple-pink iridescent feathers and a breast painted with light pink. Males are only slightly larger than females, with males weighing around 6 ounces and females weighing around 5.5 ounces when mature, but both sexes have large wingspans at more than 17 inches across. These gentle birds are known for their ability to change course quickly in flight, despite their robust bodies, and can fly at up to 55 miles per hour. When it comes time to nest, mourning doves generally mate for life and raise their young together. Here are some other interesting mourning dove facts. Mourning doves are sexually mature within 1 year of birth. They mate primarily from spring to fall but are able to mate year round and produce several clutches of young each year. When a male is ready to mate, he circles in a courtship flight and chases rivals from an area where he desires to nest. To lure in a mate, he perches in an open area and sings a lilting coo that is louder than his usual call. Once he has attracted a mate, they pair for life. Mourning dove nesting habits lead to nests on horizontal branches of evergreen and orchard trees, on man-made structures such as porch eaves and on the ground. The construction of the nest takes about 10 hours total, with the doves working together over the course of 2–4 days. The male brings twigs, grass stems and pine needles to the female, who then weaves them into a nest about 8 inches across. The transaction is a bit unusual because the male stands on the female's back while transferring the material from his beak to hers. Male and female mourning doves work together to raise their young. The female lays two pure white eggs. She sits on them at night and is then relieved by the male in the early morning. After about 15 days of sharing incubation duties, the eggs hatch, and the parents take turns feeding the chicks nutritious crop milk, which forms in their gullets (throats), for about 14 days. During this time, the mourning dove babies learn to fly. After about 3 weeks, the chicks are able to care for themselves. Mourning doves live in all 48 states in the continental United States, as well as Alaska. In far northern states that experience frigid winters, the doves migrate as far south as southern Mexico, although some birds migrate only as far as more southern states for the winter. In 2013, Partners in Flight estimated the global mourning dove population at 120 million, with 96 million birds living in the United States or at least spending some part of their migratory life there. K., Diana. "Nesting Habits of Doves." Sciencing, https://sciencing.com/nesting-habits-doves-8477240.html. 06 August 2018.